Nuredin Bakhtiari. Ursolic Acid Induces Neomyogenesis Through Hyperplasia and Increases of Satellite Cells Number in Mice Skeletal Muscle. (2016) J Stem Cell Regen Biol 2(2): 97- 101. © 2017 Bakhtiari, N. This is an Open access article distributed under the terms of Creative Commons Attribution 4.0 International License. Introduction: Ursolic Acid (UA) is the main compound present in apple cuticular wax as well as in the leaves. Hypertrophic effects of UA on the skeletal muscle ventured us to investigate if UA might activate satellite cells proliferation, and also generate new muscle fibers is so-called ” hyperplasia”. Methods: To confirm this hypothesis, UA administrated twice daily for 7 days to 8 weeks old mice (C57BL/6) and then skeletal muscle tissues isolated for new muscle fibers and satellite cells determination by histochemical and immunohistochemical tests, respectively. Results: Our results demonstrated that UA contributed to skeletal muscle rejuvenation through increasing in the satellite cells number and stimulation of these edge cells to new muscle fiber generation. Conclusion: Taken together, to the best of our knowledge, current findings sharpen our understanding of UA might be as an improvement of skeletal muscle performance and suggest that UA as potential pharmacological purpose to treat the major muscular atrophy diseases such as skeletal muscle atrophy. Skeletal muscle has a critical role in carry out locomotion, breathing, postural support and heat production during cold stress. There are about 640 skeletal muscles in human body which it is constituted of ~38% for men and 30% for women total body mass. Individual muscle fibers are the functional units of skeletal muscle that generate force by contraction. These fibers are constituted of hundreds of thread like protein filaments called myofibrils. During embryonic and fetal development the fusion of many myoblasts lead to formation of a multinucleate myofibers. The skeletal muscle is so efficient in self- regeneration even after repeated injury, for this thousand of myoblasts on each incident is required. Hence, satellite cells which resided in a niche on the surface of myofiber play main roles in muscle growth, repair, muscle fiber homeostasis, requiring for myofiber hypertrophy and hyperplasia. The satellite cells increase the number of nuclei which pointed to greater protein synthesis. In developmental process of skeletal muscle formation from embryonic and foetal times, muscle progenitor and satellite cells require Pax3 and Pax7. Previous studies have been shown that Pax3 and Pax7 involved in quiescent and activated satellite cells (so-called myoblast), respectively[7,8]. In addition, the timing of the embryonic and postnatal periods of muscle development in mouse indicated the dependence of myogenic stem cell populations on Pax genes. On the other hands, the development of skeletal muscle are including: 1- somitogenesis (Pax3/Pax7), 2- embryonic and foetal myogenesis (not tested), 3-hyperplastic and hypertrophic growth (Pax7) and, 4- hypertrophich growth, adult and aging (independent to Pax7)[7,8]. As determined during this time new muscle fibers generation occurred within 2 weeks of birth. Strictly speaking, the number of myofibers does not change after birth. According to this consideration, UA is a lipophilic compound found in apple peel, such as some folkloric herbal medicines for diabetes. Previous studies have suggested that UA applied as small molecule inhibitors of skeletal muscle atrophy, it also increased muscle mass and strength, in a laboratory animal model. Recently, it has been reported that UA increased brown fat and energy expenditure, reduced diet-induced obesity, white adipose tissue, glucose intolerance and fatty liver diseases in a mouse model of diet-induced obesity. They also declared that in mice fed a high fat diet, UA increased skeletal muscle mass, anabolic mRNA expression, Akt signaling, fast and slow skeletal muscle fibers size and grip strength. According to these consideration, skeletal muscle are chosen in this research due to their post mitotic tissue and exhibition of tissue-specific aging effects, including differences in the accumulation of mutant mtDNA. In this regard, we sought to know the effects of UA, as inhibitor of skeletal muscle atrophy and stimulator of muscle hypertrophy, on satellite cells and muscle rejuvenation. In this research we interested to know if UA might affect on muscle hyperplasia rather than hypertrophy. Male C57BL/6 mice, aged 8 weeks (~ 20 g weight), were received from Pasteur Institute, Iran, held in colony cages with 12 hr light/12 hr dark cycles, and used for tests within 3 weeks of their onset. Moreover, otherwise designated, the mice were kept on standard chow (Harlan Teklad formula 7013). UA (Enzo Life Sciences, BML-CT105-0250) was dissolved in corn oil at a 20 mg/ml concentration for intra-peritoneal injection (i.p). UA (200 mg/kg) or placebo alone (corn oil) was administrated via i.p. Injection was done twice daily for 7 days. Each mouse was subjected to three consecutive tests to obtain the peak. Histochemical and immunohistochemical tests for determination of tissue regeneration and satellite cells detection, respectively. All animal procedures were approved by the Institutional Animal Care and use Committee of the Endocrinology and Metabolism Research Center, Tehran University of Medical Sciences. Finally, for IHC and histochemical test the animals should be weighted and anaesthesized by an i.p of ketamine/xylazine and then fixation with 4% PFA, 2.5% glutaraldhyde. Tissue samples was incubated in the 30% sucrose, and stored at 4°C for H & E (0.1 mg/ml) and immunohistochemical tests. Then, they were fixed with OCT compound (Tissue-Tek). Serial cross-sections (8 μm thicknesses) were performed using a cryostat microtome at -25°C, mounted on cover slips, and then stained for cytoplasm and nucleus detection. In this method, prior to staining, slides must be blocked at room temperature for 10 minutes. Following, cytoplasmic staining by hematoxyline for 5 min, washing with PBS and water, nuclei staining by eosine for 5 min and then washing with PBS and water, dehydration by descending alcohol and, and mounting a cover slips and visualize staining of tissue under a microscope using a bright-field illumination. 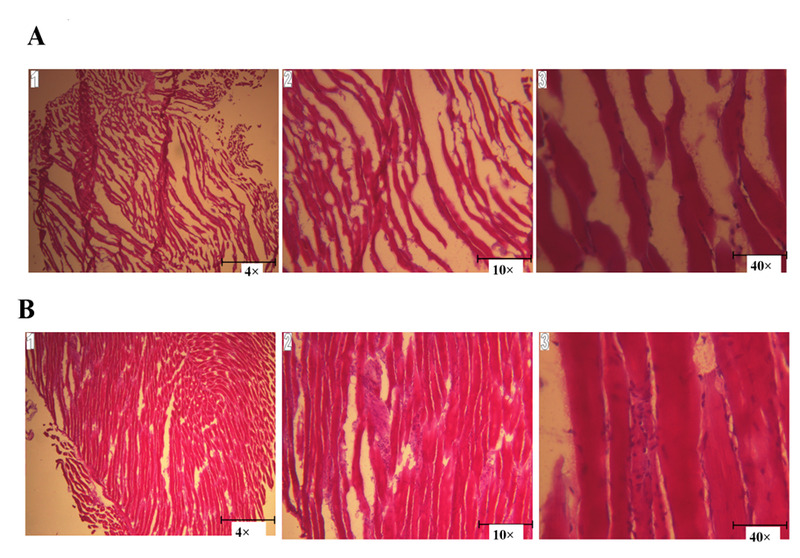 Staining of the frozen muscle sections (8 μm) was performed as described by Sherwood et al. In this procedure, we acted as follows: thaw the slides at room temperature for 10 - 20 minutes, when staining cryostat sections stored in a freezer, rehydrated the slides in the wash buffer for 10 minutes, surround the tissues with a hydrophobic barrier using a barrier pen (ab2601, Abcam). To quench endogenous peroxidase activity, incubate the sample with 1-3 drops peroxidase blocking reagent (3% H2O2 in water) for 5 - 15 minutes. Rinse the sample, and gently wash in wash buffer for 5-minutes. Blocking the section with 1 - 3 drops of serum blocking reagent (0.5% BSA for 30 min at 37°C) for 15 minutes. Then, samples were incubated by primary antibody Pax7 (ab6107, Abcam) (1/100 in 1% BSA + 0.5% skim milk) for 1h at 37°C. Rinse the samples with wash buffer. Incubating the samples with Horse Raddish Peroxidase (HRP) - conjugate goat anti-rabbit polycolonal IGg (SC-J2811). Rinsing and washing 3 times in the wash buffer for 2 minutes. Adding 1-5 drops of DAB/AEC (CTS011) chromogen solution to cover the entire tissue section, and incubate for 20 minutes. Rinsing the samples with the wash buffer. Rinsing in deionized H2O and mounting a cover slips and visualize staining of tissue under a microscope using a bright-field illumination. Since, the process of two adjacent membranes fusion accomplishes many goals that are crucial to the development and maintenance of the skeletal muscles; we directly tested if UA might trigger myoblast fusion in adult mice. Therefore, cross-sections of myofibers from the control and treated mice stained by H & E. As shown in Figure 1A and 1B, the presence of centrally nucleated myofibers and collectivity of nuclei in the UA-treated mice exhibited a hallmark of muscle regeneration which illuminates a new fiber generation. Figure 1: UA neomyogenesis stimulation through satellite cell proliferation and myoblast fusion: The mice received corn oil and UA+ corn oil (ip) containing 200 mg/kg UA for 7 days; (A-B) 8 μm cross-sections of gasterocnemius muscle for observation of myofiber regeneration stained by H & E using 3 different magnifications (1) 4X, (2) 10X and (3) 40X. The presence of centrally nucleated myofibers indicates a hallmark of muscle regeneration; (A): Corn oil; and (B) UA+ corn oil. Satellite cells waking up induction in adult mouse muscle by UA To access the effects of UA on the muscle rejuvenation, next we sought to consider the UA influences on the satellite cell proliferation. 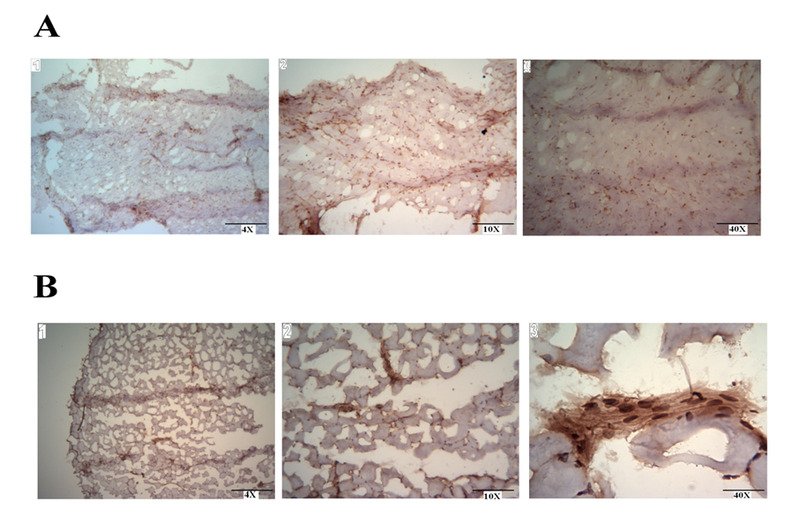 Therefore, we examined the PAX7 expression in the treated and control mice muscles by immunohistochemistry method. Specifically, as illustrated in Figure 2A and 2B, there was a noteworthy alteration in the number of myonuclei following the UA administration to the mice. Figure 2: UA increases satellite cells proliferation by up-regulation of Pax7. The mice were received corn oil and UA+corn oil (i.p) containing 200 mg/kg UA for 7 days. (A-B) 8 μm Cross-sections of gasterocnemius muscle for observation of satellite cells by Pax7 as an identifier of these cells using 3 different magnifications (1) 4X, (2) 10X and (3) 40X; (A): Corn oil; and (B) UA+ corn oil. Satellite cells are small mononuclear progenitor cells with responsibility in the repair of injured fibers, differentiate and fuse to augment existing muscle fibers and proliferate to form new fiber generation. There are two ways in new fibers formation. First, fiber splitting from large fibers into two or smaller fibers[16,17] Second satellite cells activation[18-20]. According to the recent study that showed the hypertrophic effects of UA on the skeletal muscle, we more motivated to investigate if UA might stimulate skeletal muscle hyperplasia as well. Remarkably in the H & E-stained samples of UA-treated mice, the results indicated the elevation in the number of nuclei, which astonishingly were centrally located in the cytoplasm and also new fibers have been generated (Figure 1A and 1B). In support of this hypothesis, a previous study has been shown that the fusion of myoblast promotes new fibers development (multinucleation, or so-called neomyogenesis), which plays an essential role in the muscle function[21,22]. Furthermore, There are two ways for promoting new fibers formation i.e. fiber splitting from large fibers into two or smaller fibers[16,17] and satellite cells activation[18-20]. It has been reported that enhanced SIRT1 expression in the satellite cells stimulates their proliferation by inhibiting the expression of the cell cycle inhibitor P21Waf/Cip1 and P27Kip1. On the other hand, SIRT1 by promoting PAX7 expression prohibit the muscle formation by suppressing the myogenic gene program (MyoD and Myf5). Further, provoked by these findings, we set out to explore the immediate crucial question if UA might induce satellite cells proliferation. To answer this question, our observations identified novel populations of cells that express PAX7, which are resided in the skeletal muscles, gastrocnemius myofibril (Figure 2B). Satellite cells are characterized by the expression of the paired box transcription factor PAX7 . On the other hand, it has been reported that PAX7 is required for satellite cell survival and proliferation, and for prohibiting differentiation progress of myogenic progenitor cells. Satellite cells of the adult skeletal muscle fibers are myogenic mono-nucleated cells that are strictly adhered to the muscle fibers. They are more numerous in slow-twitch than in fast-twitch muscles IIB. Besides, the highest turnover rate of these quiescent cells in normal muscles is 1% per week but injury, extreme muscle activity, mechanical stretching, and also androgens induce proliferation and ultimately fusion into myotubes. As we comprehended about UA, it seems that it by increasing satellite cells activation leads to generate large fibers (hypertrophy), and also inducing in fiber splitting into smaller fibers to prevent muscle atrophy. Furthermore, recent studies showed that there is a molecular network between PGC-1α, neuromuscular junction (NMJ) and the skeletal muscle satellite cells[28,29]. The co-activator PGC-1α allows recruitment of GA-binding protein and led to up-regulation of a broad NMJ gene program. Accordingly, the results showed that satellite cells were more observed to concentrate at the NMJ. Taken together; our findings demonstrate that UA by recruiting in the satellite cells activation and fusion to each other result in new myofiber generation, strictly speaking hyperplasia versus hypertrophy. Finally, our results strongly proposed UA as an excellent candidate for pharmacological purpose in treatment of skeletal muscle myopathy such as, Duchenes musular dystrophy, skeletal muscle atrophy (SMA). I am obligated to staff members of Stem Cell technology Research Center, Tehran, Iran, specifically Dr. Vahid Haghpanah, for the valuable information provided by them in their respective fields. I am grateful for their cooperation during the period of my assignment. We wish to thanks from Deputy of Research and Technology of Sanandaj Branch, Islamic Azad University, Sanandaj, Iran. The work presented here was carried out in stem cell technology research center, Tehran, Iran. 1. Wang, Y., Winters, J., Subramaniam, S. Functional classification of skeletal muscle networks. I. Normal physiology. (2012) J Appl Physiol 113(12): 1884-1901. 2. Janssen, I., Heymsfield, S.B., Wang, Z.M., et al. Skeletal muscle mass and distribution in 468 men and women aged 18-88 yr. (2000) J Appl Physiol (1985) 89(1): 81-88. 3. Rochlin, K., Yu, S., Roy, S., et al. Myoblast fusion: when it takes more to make one. (2010) Dev Biol 341(1): 66-83. 4. Sadeh, M., Czyewski, K., Stern, L.Z. Chronic myopathy induced by repeated bupivacaine injections. (1985) J Neurol Sci 67(2): 229-238. 5. Sacco, A., Doyonnas, R., Kraft, P., et al. Self-renewal and expansion of single transplanted muscle stem cells. (2008) Nature 456(7221): 502-506. 6. Lepper, C., Partridge, T.A., Fan, C.M. An absolute requirement for Pax7-positive satellite cells in acute injury- induced skeletal muscle regeneration. (2011) Development 138(17): 3639-3646. 7. Lepper, C., Fan, C.M. Inducible lineage tracing of Pax7-descendant cells reveals embryonic origin of adult satellite cells. (2010) Genesis 48(7): 424-436. 8. Lepper, C., Conway, S.J., Fan, C.M. Adult satellite cells and embryonic muscle progenitors have distinct genetic requirements. (2009) Nature 460(7255): 627-631. 9. Liu, J. Oleanolic acid and ursolic acid: research perspectives. (2005) J Ethnopharmacol 100(1-2): 92-94. 10. Kunkel, S.D., Suneja, M., Ebert, S.M., et al. mRNA expression signatures of human skeletal muscle atrophy identify a natural compound that increases muscle mass. (2011) Cell Metab 13(6): 627-638. 11. Kunkel, S.D., Elmore, C.J., Bongers, K.S., et al. Ursolic acid increases skeletal muscle and brown fat and decreases diet-induced obesity, glucose intolerance and fatty liver disease. (2012) PLoS One 7(6): e39332. 12. Campisi, J., d'Adda di Fagagna, F. Cellular senescence: when bad things happen to good cells. (2007) Nat Rev Mol Cell Biol 8(9): 729-740. 13. Kunkel, S.D., Suneja, M., Ebert, S.M., et al. mRNA expression signatures of human skeletal muscle atrophy identify a natural compound that increases muscle mass. (2011) Cell Metab 13(6): 627-638. 14. Sherwood, C.C., Holloway, R.L., Erwin, J.M., et al. Cortical orofacial motor representation in Old World monkeys, great apes, and humans. II. Stereologic analysis of chemoarchitecture. (2004) Brain Behav Evol 63(2): 82-106. 15. Scharner, J., Zammit, P.S. The muscle satellite cell at 50: the formative years. (2011) Skeletal muscle 1(1): 28. 16. Antonio, J., Gonyea, W.J. Muscle fiber splitting in stretch-enlarged avian muscle. (1994) Med Sci Sports Exerc 26(8): 973-977. 17. Ho, K.W., Roy, R.R., Tweedle, C.D., et al. Skeletal muscle fiber splitting with weight-lifting exercise in rats. (1980) Am J Anat 157(4): 433-440. 18. Bischoff, R. Interaction between satellite cells and skeletal muscle fibers. (1990) Development 109(4): 943-952. 19. Darr, K.C., Schultz, E. Exercise-induced satellite cell activation in growing and mature skeletal muscle. (1987) J Appl Physiol (1985) 63(5): 1816-1821. 20. Giddings, C.J., Gonyea, W.J. Morphological observations supporting muscle fiber hyperplasia following weight-lifting exercise in cats. (1992) Anat Rec 233(2): 178-195. 21. Abmayr, S.M., Pavlath, G.K. Myoblast fusion: lessons from flies and mice. (2012) Development 139(4): 641-656. 22. Hawke, T.J., Garry, D.J. Myogenic satellite cells: physiology to molecular biology. (2001) J Appl Physiol (1985) 91(2): 534-551. 23. Rathbone, C.R., Booth, F.W., Lees, S.J. Sirt1 increases skeletal muscle precursor cell proliferation. (2009) Eur J Cell Biol 88(1): 35-44. 24. Fulco, M., Schiltz, R.L., Iezzi, S., et al. Sir2 regulates skeletal muscle differentiation as a potential sensor of the redox state. (2003) Mol Cell 12(1): 51-62. 25. Buckingham, M. Skeletal muscle progenitor cells and the role of Pax genes. (2007) C R Biol 330(6-7): 530-533. 26. Allouh, M.Z., Yablonka-Reuveni, Z., Rosser, B.W. Pax7 reveals a greater frequency and concentration of satellite cells at the ends of growing skeletal muscle fibers. (2008) J Histochem Cytochem 56(1): 77-87. 27. Verdijk, L.B., Koopman, R., Schaart, G., et al. Satellite cell content is specifically reduced in type II skeletal muscle fibers in the elderly. (2007) Am J Physiol Endocrinol Metab 292(1): E151-7. 28. Arnold, A.S., Gill, J., Christe, M., et al. Morphological and functional remodelling of the neuromuscular junction by skeletal muscle PGC-1alpha. (2014) Nat Commun 5: 3569. 29. Handschin, C., Kobayashi, Y.M., Chin, S., et al. PGC-1alpha regulates the neuromuscular junction program and ameliorates Duchenne muscular dystrophy. (2007) Genes Dev 21(7): 770-783.